En español | Every year doctors place about 1 million stents in patients to open blocked arteries of the heart, according to the Millennium Research Group, a medical technology marketing group. Unclogging a blocked artery with balloons and stents saves lives when performed during a heart attack, but a growing body of research says it often does no good in nonemergency situations. 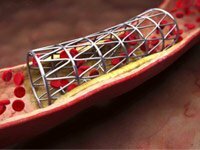 One landmark 2007 study found that although stents — wire mesh tubes that help prop open arteries — may help relieve severe chest pain, there is no proof that stents are any better than less expensive drugs in preventing heart attacks or death. Still, doctors continue to perform the balloon procedure, called angioplasty, and to implant stents, at a cost of as much as $12 billion annually, with much of that expense falling on taxpayers. The federal government, through Medicare, paid out $3.5 billion in 2009 alone for cardiac stents — at a time when runaway medical spending is increasing the huge federal deficit. Numbers like these trouble Rita Redberg, M.D., a professor at the University of California in San Francisco and editor of the Archives of Internal Medicine. Redberg, a frequent critic of wasteful Medicare spending, says doctors should know that drug treatment — including aspirin, statins, beta blockers and ACE inhibitors — is less expensive, has fewer side effects and is just as effective as inserting a stent. But most patients haven't gotten the message. "We have a culture of medicine where technology is frequently seen to be better than medicines or lower-tech solutions," Redberg says. "People think if you open up an artery, that should be better than taking medicine." Costs aside, there are small but real risks associated with having a stent inserted, she points out. These include having a heart attack or having the stent fail and close off the blood vessel. Even with a stent, many patients must also take Plavix and aspirin to thin the blood, and they carry their own costs and complications. Paul Chan, M.D., a cardiologist at St. Luke's Mid America Heart and Vascular Institute in Kansas City, Mo., led a 15-month review of some 500,000 angioplasties to see whether the procedures followed the guidelines developed by heart specialists. The study, published in the Journal of the American Medical Association, found that 99 percent of more than 355,000 angioplasties performed in acute situations, such as a heart attack or high-risk unstable angina, were clearly beneficial. But 145,000 procedures were performed in nonemergency cases. In that group, just half of the angioplasties were classified as appropriate, 38 percent were rated as uncertain and 12 percent were found to have no benefit, Chan says. That's about 15,000 inappropriate procedures per year, he says, or about $300 million in needless medical spending. A second study, published in the Archives of Internal Medicine, reviewed the insertion of stents more than 24 hours after a heart attack, a practice deemed "useless" in a major federal study in 2006. Judith Hochman, M.D., a cardiologist at New York University, found that in the years after practice guidelines were revised to discourage placing stents in patients more than 24 hours after they had a heart attack, doctors nevertheless continued to perform the procedure at the same rate as before. Hochman, who also led the 2006 study, says most people picture the circulatory system like household plumbing — if there's a clog somewhere in the line, it makes sense to open it. But it isn't that simple. In patients with stable artery blockages, new blood vessels often sprout, routing blood around the obstruction, Hochman says. This improved circulation may not allow peak exercise, she says, "but in most of the activities of daily living it is sufficient to provide blood flow." But this network of blood vessels disappears when a blocked artery is opened with a stent. Should the stent fail — as sometimes happens — Hochman says, "patients actually have another heart attack or they die when the artery suddenly closes and they're no longer protected immediately with that blood flow from the other arteries." So why are stents so popular? "There's a pretty strong belief that an open artery is good," Hochman says. "These beliefs die hard." Patient expectations also play a role. "A lot of them say, 'The artery's closed. I want it open,' " she says. A doctor also might perform an unneeded angioplasty to forestall allegations of negligence should the patient die, she adds. Chan thinks primary care doctors have become more aggressive in referring patients with a few risk factors to cardiologists, who are primed to act. The cardiologist might implant a stent simply to avoid contradicting the referring doctor, Chan says. Meanwhile, in a fee-for-service system, doctors are paid for the procedures they perform. "I think there's no incentive to self-regulate," Chan says. In fact, there is so little self-regulation of this procedure that some doctors have wildly abused it. In Baltimore, John R. McLean, M.D., was convicted of six counts of health care fraud after a jury heard he had inserted stents in more than 100 patients without medical justification. St. Joseph's Medical Center in Towson, Md., had to notify more than 500 patients that its former chief of cardiology, Mark Midei, M.D., might have performed questionable stent procedures on them. Midei, who has since lost his medical license, once implanted 30 stents in a single day, investigators found. Learn the two most important questions to ask when deciding whether to get a stent to open a blocked artery. Other cases of improper procedures have been reported in Pennsylvania, Louisiana and Texas, suggesting that this may be just the tip of the iceberg, experts say. Redberg agrees doctors may not have sufficient incentive to follow guidelines, and has called for Medicare to quit paying for useless interventions. She also wants to see more informed discussion with patients about the risks and benefits of drug therapy versus stents. "That would help a lot, because clearly the recent data shows that patients are under the impression that stents are better for preventing heart attacks," she says. Redberg agrees with Chan that a fee-for-service system that pays doctors for the number of procedures they perform needs to change. "We're spending almost $3 trillion a year for health care, and you wonder, how did we get here?" she says. "When you pay a lot of money for doing a lot of expensive procedures, you get a lot of expensive procedures," she says. "We're not differentiating between the ones that help people feel better and the ones that aren't."